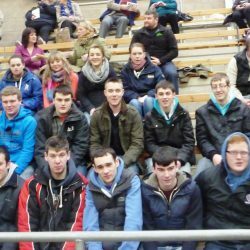 College of Agriculture, Farming and Rural Enterprise (CAFRE) level three apprenticeship/work-based diploma students recently completed a successful study tour of a range of farm enterprises across Scotland. The first visit was to Hartbush Farm, near Amisfield, Dumfries which is a Quality Meat Scotland monitor farm run by John and Amanda Paterson. The farm comprises 302 hectares of owned and conacre land and has 260 suckler cows, mostly Simmental and Limousin crosses and 410 ewes. All heifers and 190 cows are spring calvers with the remainder summer calving. Simmental bulls are used to breed herd replacements while Charolais bulls are used as terminal sires to breed most of the fattening cattle. Spring born male calves are kept entire and finished as yearling bulls. The next stop was to visit an organic dairy farm operated by Gavin Lochhead and his son Jonathan. The dairy herd comprises Brown Swiss cows and milk produced on the farm is processed on-farm into cheese. A new dairy unit for over 150 cows has recently been constructed on a green-field site on the farm. This unit includes cubicle housing and three robotic milking machines. A new calf rearing unit is currently under construction. 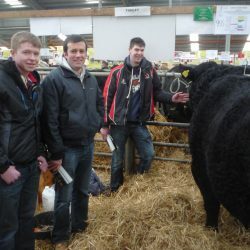 A visit to the Stirling bull sale afforded students the opportunity to see Aberdeen Angus bulls sell to a breed average of £6,107, for 83 bulls and topping at 18,000gns for the overall and junior champion, Haymount Precursor. The next venue was a dairy farm near Blair Drummond, hosted by owner David Hamilton. He gave a detailed overview of how he successfully manages his farm business and highlighted the necessity to pay attention to detail and be prepared to make changes that can improve the running of the business. 700 cows are milked three times a day using a 50 point rotary parlour. Cubicles are bedded with oat by-product and lime and this has been effective in controlling the cell count. The herd average is 10,500 litres, and 11 people are employed on the farm throughout the year. 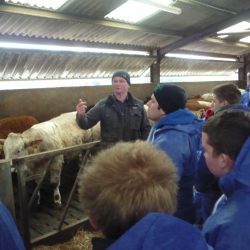 During a visit to Blackford Farms Ltd in Dunblane, students were introduced to the merits of Waygu Cattle. In addition to farming pedigree Aberdeen Angus, Beef Shorthorn, Highland Cattle and Dexters, Blackford Farms is the largest Waygu breeder in the UK. Waygu beef is renowned for its high marbling characteristics which leads to it attracting premium prices. The final visit of the tour was hosted by Jim Brown and his son. The Brown family finish 2500 beef cattle per year on a 130 hectare farm in central Scotland. Cattle are fed a ration of 45kg potatoes and 5kg silage through a diet feeder with an average daily liveweight gain of 1.3 kg/day. Cattle are bought at local marts and include Limousin, Charolais, Simmental and Angus. Finished cattle are sold to local butchers and London butchers.